This round of our Fanciful Utility Swaps was the Romantic Swap, focusing on fabrics from the Romantic Era, the 1820s through the 1840s. These are decades of vibrate color and playful to wild designs. This meant for some very fun fabics arriving in the mail. 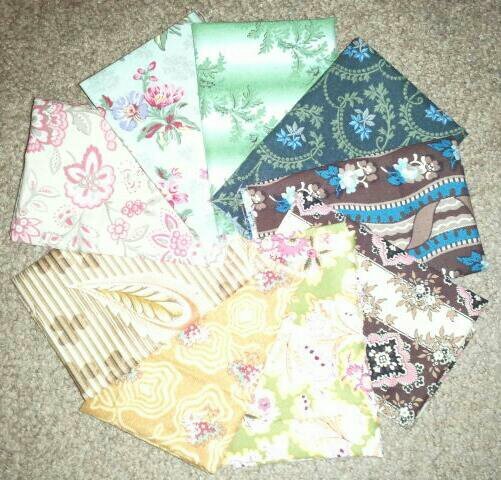 Here are the fabrics we swapped. 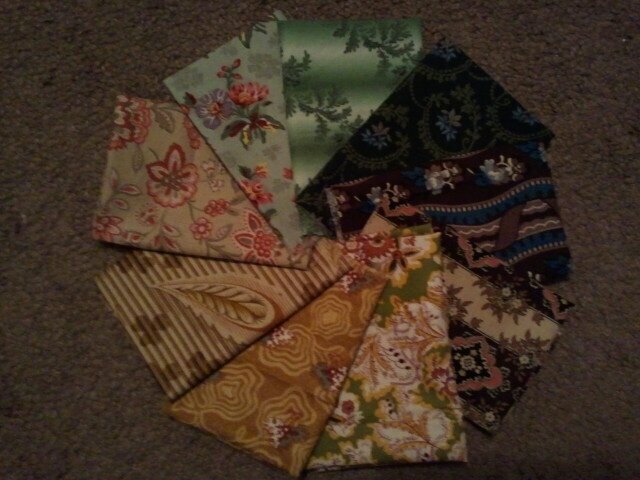 I had to take the photos with and without the flash, though neither really captured the fabrics in their true light. I hope I have the fabrics labeled right. I flip-flopped which group a couple belong in. Pink and white resist or discharge print with narrow stripes over top, likely a roller print. Cindy already dove in with her swap pieces. 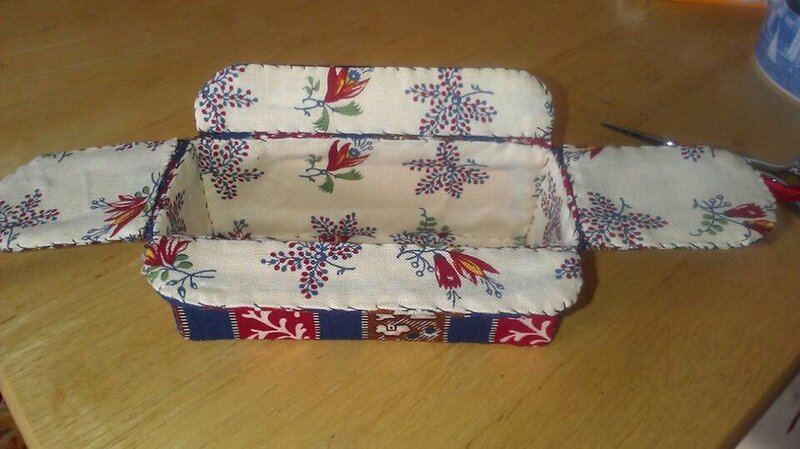 Using the techniques in Fanciful Utility, she recreated the French sewing box I was obsessed with last fall. She made a great box. I am impressed that she lined up the stripes so well. Fabulous Cindy! I’m so excited to see that she used a swatch I sent! 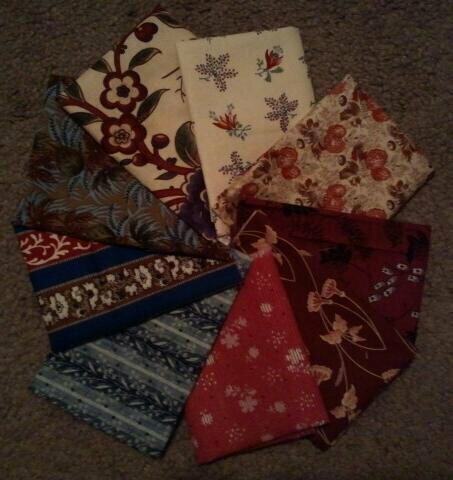 It was fun receiving all the different fabrics…nice to have such a variety from which to choose. Thanks to all. The blue on blue roller print is from me – it’s called General’s Wives. I’m making scissor cases from my swatches! Thanks. I’ll fix it in the morning. Thanks! Those fabrics spoke loudly to me!! Once again, I missed the time frame! I love the fabrics. As I’ve never done this before, please share where y’all find these beauties! The next swap is coming up in about a week. It was so much fun getting these in the mail, thanks everybody! And thanks for the additional information on some of these fabrics. By the way, Group I and Group II are cross-labelled. The first group shown is Group II! I sent two Mill Girls fabrics, #1 (as you have correctly labelled) and #4. Any information on #4 in your second photo set, which was actually in our group? 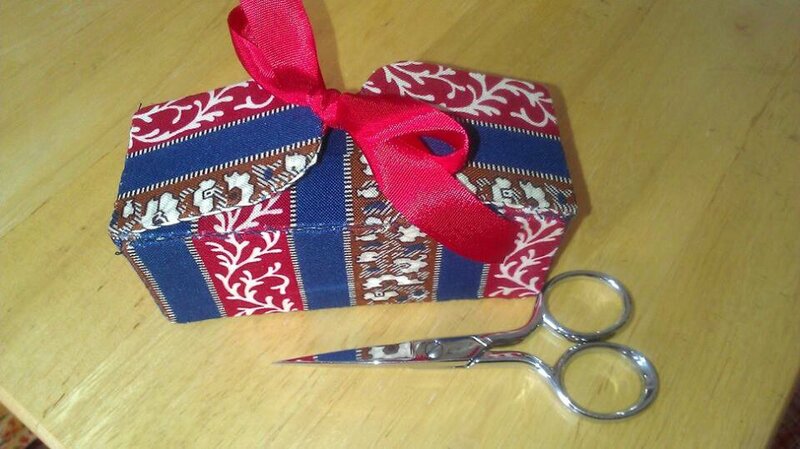 Cindy, so great to see your wonderful box, and like Jean I am thrilled to see my fabric (the lining) in action! Thanks for figuring out my confusion! I thought I flip-flipped where the fabrics I sent were. I flipped the group numbers then. I’ll see what I can find on the fabric, unless someone else knows. I just looked back at the fabrics. A little more background on that fabric. It came from the quilt shop I remembered having a wonderful set of Prussian blues and Turkey reds. The shop doesn’t have those any more. This fabric was on the fat quarter shelves, without a name or selvage print on any piece. I will hunt it down. I’m interested in 2 of the fabrics on these pages, Group 2. Do you sell or swap, please advise. 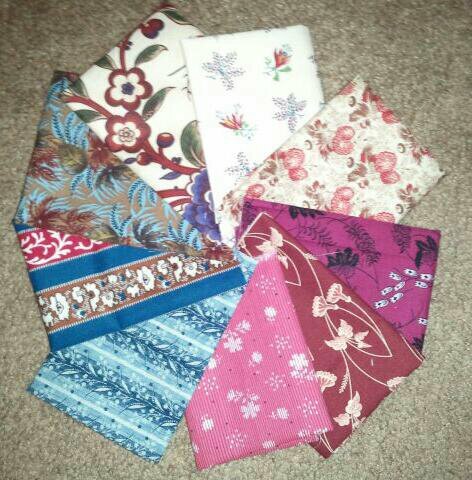 These were fabrics we swapped a while back. Each of the fabrics came from people in the swapping groups. You may want to take the photo to your local fabric shop to see if they can get it. I don’t sell fabric. How did I miss this one? It’s my favorite era for fabric.